Trains, Planes, Automobiles AND Boats! 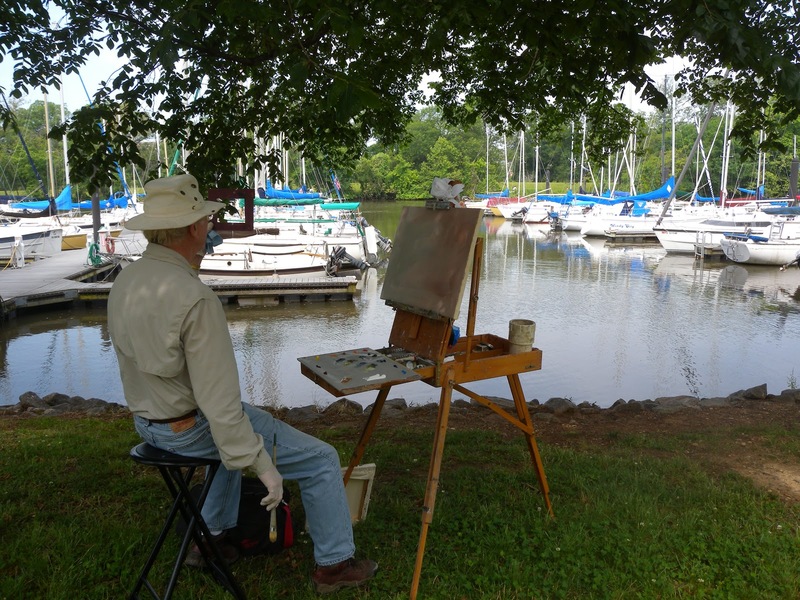 ﻿﻿﻿ This morning I was back at one of my favorite locations to paint, Daingerfield Island/Washington Sailing Marina. The location is just below Reagan National Airport on the Potomac. 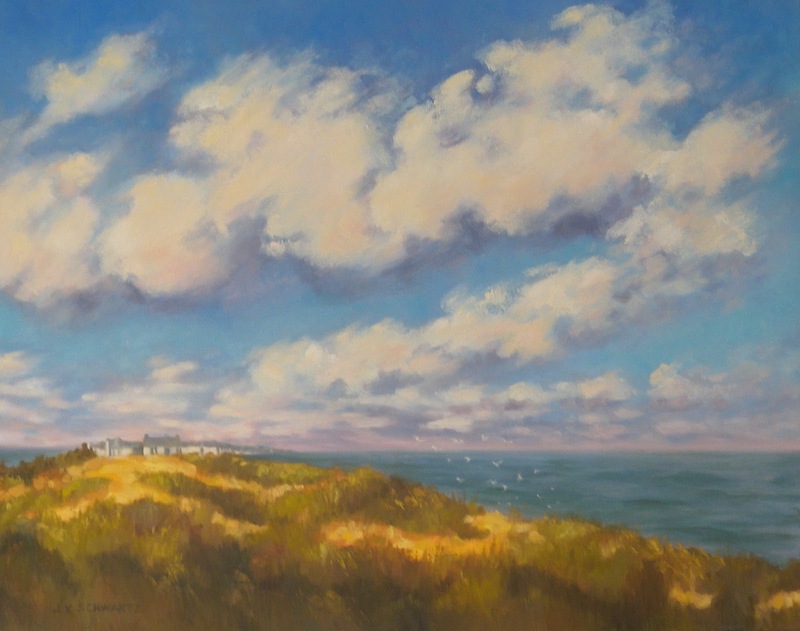 You can see the airport tower in the distance on the right hand side of the painting. 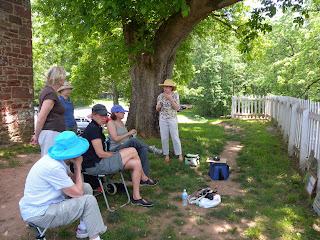 I was joined by two other members of the Art League Plein Air Painters (ALPAPs), Kim Stenberg and Richard Neff. 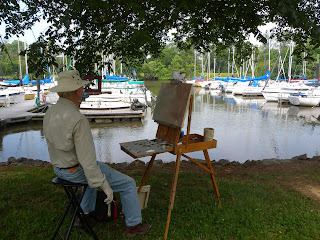 The morning was hot, humid and hazy but that made for lovely atmospheric conditions to paint! I was lucky to be there when a private sailing lesson was being given on one of the Marina's Solings. The two boats pictured were actually the same boat practicing tacking maneuvers. If I were really lucky one of the group classes might have been out but then there are plenty more opportunities this summer. 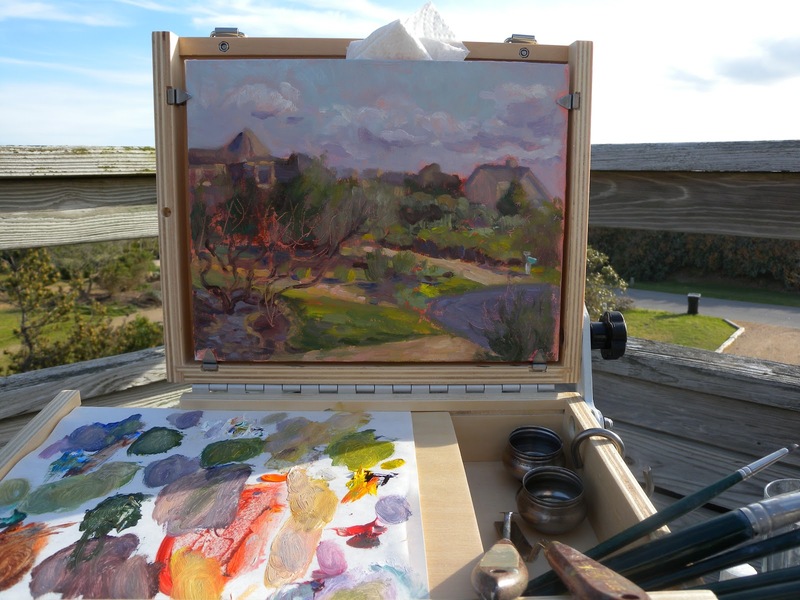 There are other reasons I like painting here besides the many subjects to choose from. For one thing there are the sounds and activity. 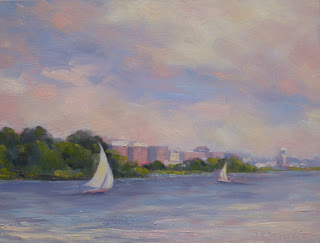 The planes landing at Reagan are roaring overhead, I can hear the trains running on the other side of the George Washington Parkway, I can hear people talking and laughing on the terrace of Blue Indigo Restaurant and yet it grows quiet enough to hear the water lapping and the riggings on the boats jangling. If I were to sum this place up in one word it would be congenial. I always end up meeting people and having pleasant conversations. This morning I met the Morrisette brothers who were enjoying the views and were on their way to lunch at the restaurant. 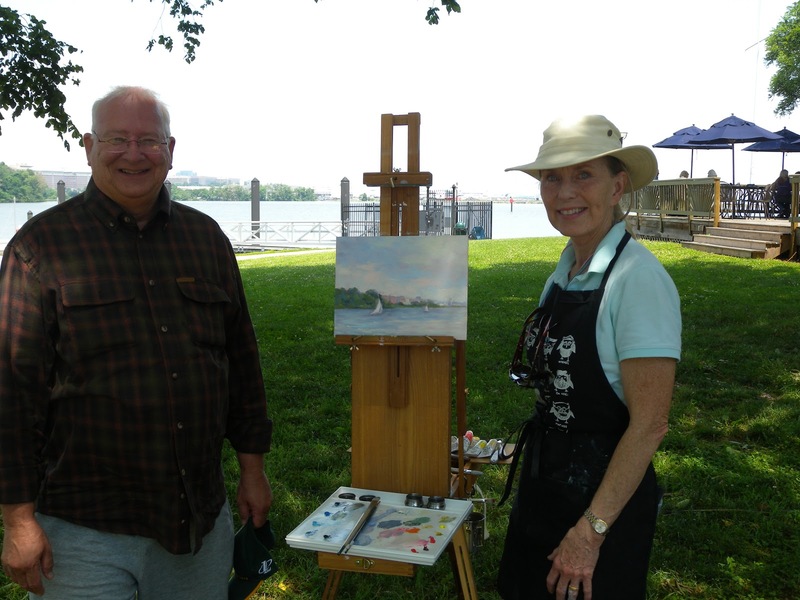 It is always gratifiying when someone enjoys seeing me paint. People just seem to like seeing an artist painting plein air and they are always so supportive! 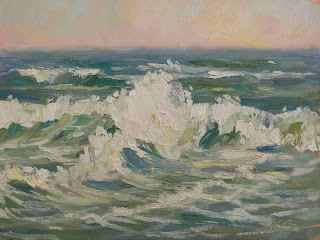 I often tell artists who feel they will be uncomfortable painting in public that they will very soon change their mind. They will receive smiles, thumbs up and meet some very nice folks. The painting doesn't have to be a masterpiece, people will appreciate the undertaking. 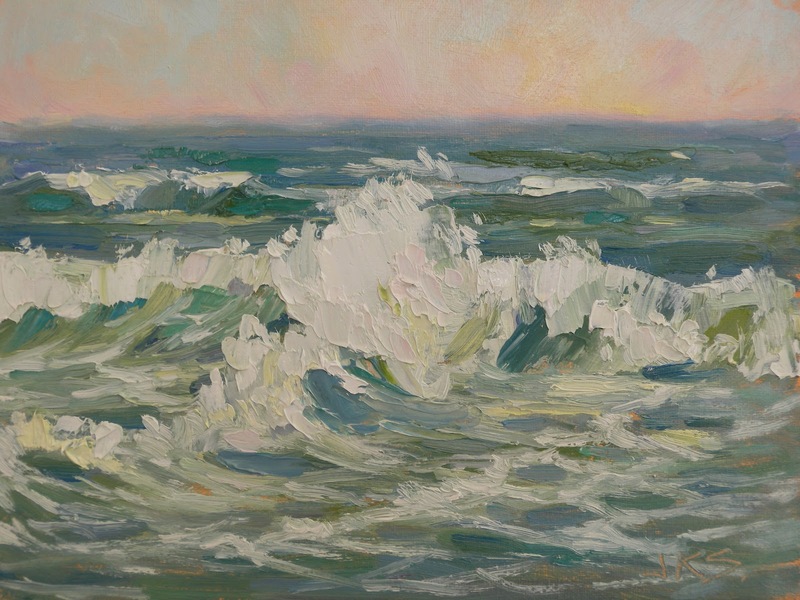 Time has really flown and I realized yesterday that it was time to get this painting shipped to Michigan for the Oil Painters of America Summer Salon Show. It will be in the resort town of Petoskey from June 21st until August 31st and I am truly happy to be part of this. Being part of anything with OPA is a good thing. If you would like to read about the upcoming show and see some wonderful paintings go to this link; www.oilpaintersofamerica.com The salon show information is on the menu on the right and all the paintings in the show have been uploaded there. We are getting ready to leave for the Outer Banks of North Carolina again and I am eager to get back on the beach and paint. I am very much in plein air mode right now but need to plan what I will be painting in the studio next. So many subjects come to mind as I have had a lot of inspiration. There is Lake Cayuga in NY State, the Potomac, and the wonderful pastures of Northern Virginia. Whatever I decide I think I want to work on gessoboard again. I need to prepare some panels and I think it wise not to start anything until I get back in town. Instead I will get out with my pochade box and paint. I plan on heading to Daingerfield Island early this week. 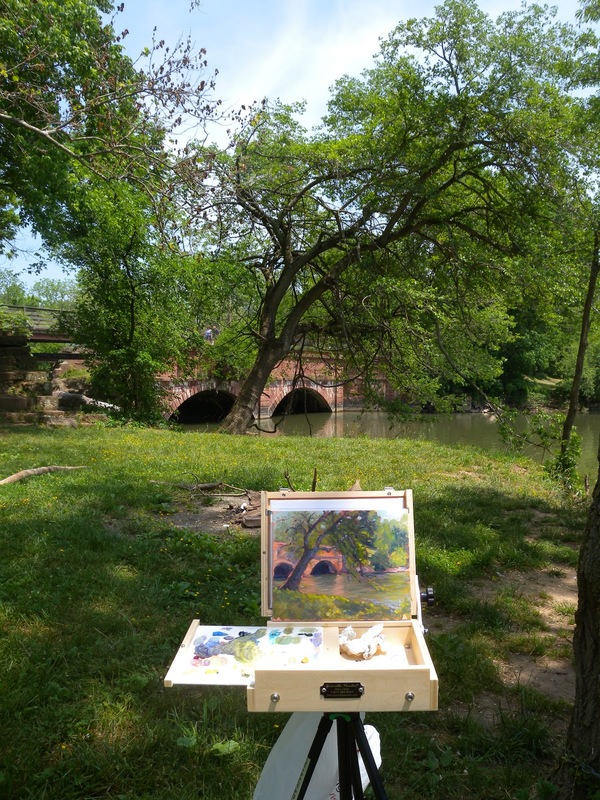 It is a wonderful location to paint and just 10 minutes away! 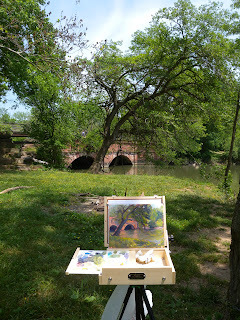 Here is an image of my completed plein air painting from Wednesday. The colors are off a little. The original (which you can see on the easel in my last post) is not so green. It was difficult taking photographs today because the weather was dark and dreary and I had to use the studio lights. Not great for taking photos. To all my readers here in the States, I hope you are able to enjoy the Memorial Day Weekend. Mother Nature has been hitting hard just try to remember all the beauty she provides. My best to all! We spent last weekend in one of my favorite places, Ithaca, New York on Lake Cayuga. We were there for a very special reason. Our granddaughter Jesse was graduating from Ithaca College. We are so proud of her! As a grandma (I wear the title proudly) I am tempted to upload a bunch of graduation pictures and photos from our celebratory family lunch. However, this is an art blog and I imagine you are much more interested in what I have been up to with my painting. 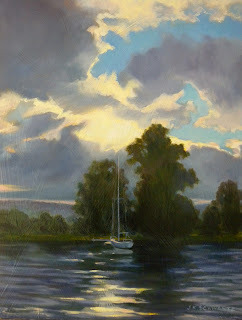 However, I do hope to show you some new Lake Cayuga paintings shortly. There was no time to paint from the beautiful Taughannock Inn (right on the lake) where we stayed but I took a lot of photos and will work from them shortly. We are back home and I am back to work. Yesterday I drove across the Potomac to Rileys Lock on the C&O canal in Seneca Maryland. What an incredible location! I was there as the guest of the Washington Society of Landscape Painters and it was a beautiful morning to paint. The day was hot and humid but the light lovely. There were so many tempting spots to pick but in the end I was drawn to the edge of the Potomac as usual. 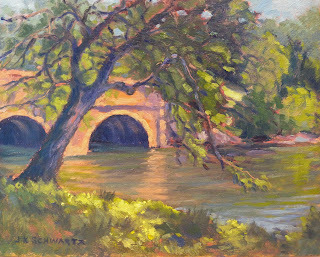 I found a shady, breezy spot with the river directly behind me and I looked towards the entrance of the canal and the bridge going over it. The late morning light hitting the bridge made it glow with warmth and it was a welcome foil to all the green around me. 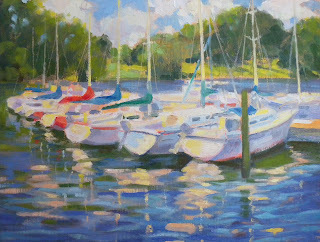 Here is the painting on the easel when it was time to break and join the others for lunch and critique. I will finish some details in the studio. It is a keeper! Here is one more image to share today. 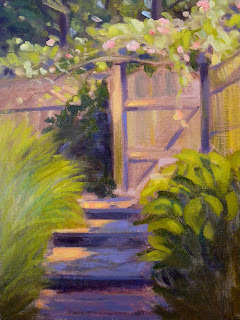 I painted this little painting last May looking out the door from my studio. That is my favorite "New Dawn" climbing rose that I planted years ago. Its bloom is a much looked forward to event every year. Last summer in the extreme heat and humidity it became diseased and I feared I had lost it forever. It had to be drastically cut back, everything removed from over the fence and gate and really not much left at all. It was painful. However, you can't keep a good rose down:) It has made a comeback. It is now up the side of the fence and peaking over the top of the gate a little. It is in bloom and a welcome sight it is! It is time to leave it alone! I wanted to finish up today because we are going out of town for a few days. Sometimes it is good to get away from a painting and sometimes it is not. This is one I felt I needed to work on each day until completed. Now I need to get it out of my sight so I don't fiddle with it. At the last moment I painted in a little section of fence over by the tree. It was an impulsive move and I hope I won't regret it. When I start second guessing myself I am prone to overworking a painting and then ruining it. I like this right now and I hope I feel the same way when I see it again next week. 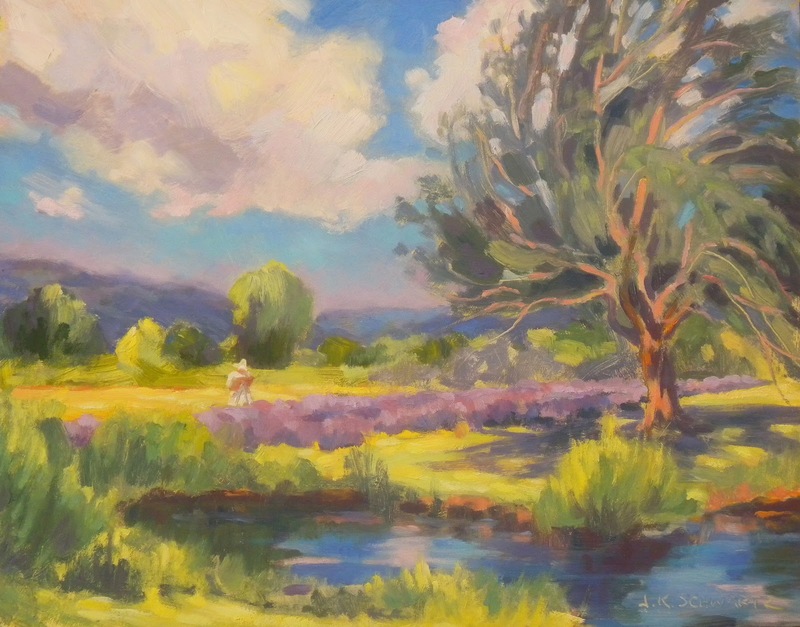 Because my painting of the lavender fields sold quickly at the Art League Bin Gallery this month I have been asked to bring down another painting. 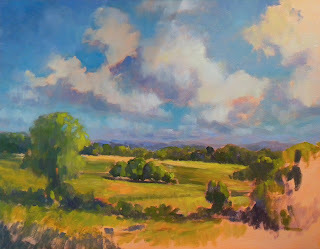 I will do that tomorrow and have selected a plein air painting I did in August of 2011. The title is "From the Top of Sugar Loaf Mountain" and I am sure you can figure out that it is so titled because I painted it from the summit of that mountain. In "Blue Ridge" the peak you see in the distance on the right side of the painting is in fact Sugar Loaf Mountain which is located in Maryland. 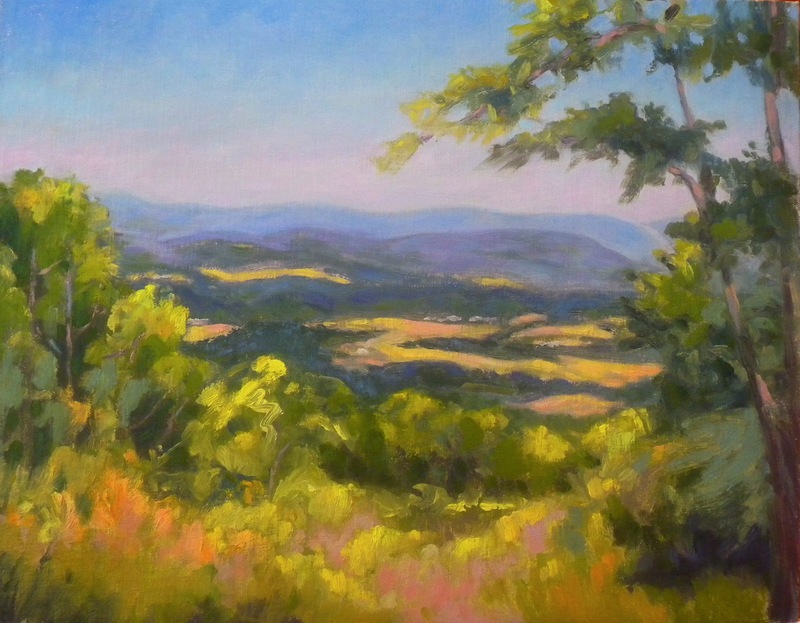 My plein air painting shows the view from the summit looking back towards Virginia and these pastures. 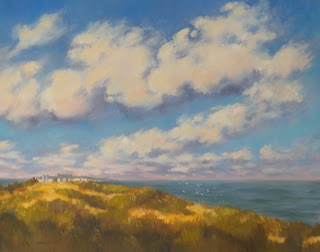 If you want to read about this painting and see it in progress go back to August 2011 in the archives and read my post there. Third Painting Session on "Blue Ridge"
I duked it out with Blue Ridge for the better part of today and I am still not finished. I got off track with this one and created some problems that needed to be solved. I am still solving them. 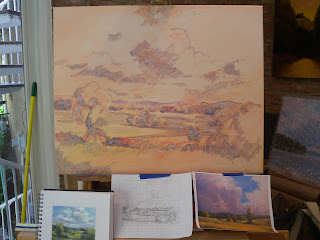 To begin with my horizon line in my study was lower making the painting mostly about the sky. 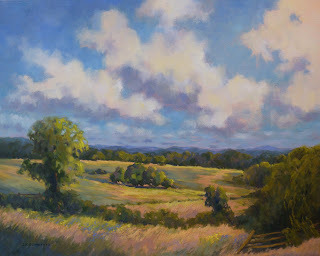 As I painted the rolling pasture the horizon line rose as I became intrigued by the colors and undulations in the field. This got close to dividing the painting in half. I don't like that. Especially when the sky is so blue and the fields so green. 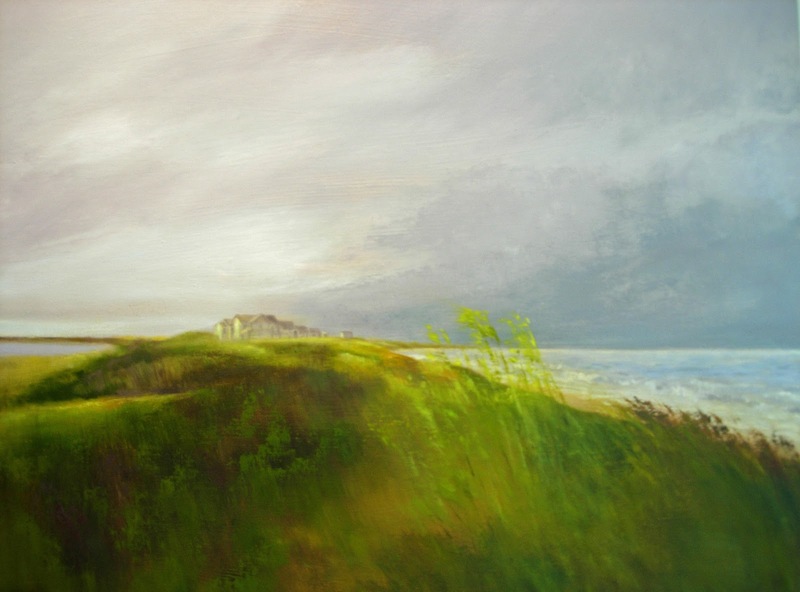 Spring and summer here is REALLY green and I have to mix lots of different greens and neutrals to keep the painting from just screaming green! Three other things I did to keep the painting from dividing in half were: 1. Add more receding clouds near the ridge line creating a greater sense of distance 2. Accentuate the line of the far end of the field where the sun was hitting. I made this a light yellow to draw the eye more to that line which is below the half way point. 3. Add more blues and yellowish pinks to the foreground to echo the colors in the sky and clouds. These things helped a great deal. I am still working on the lower right corner and like the old fence I added here. 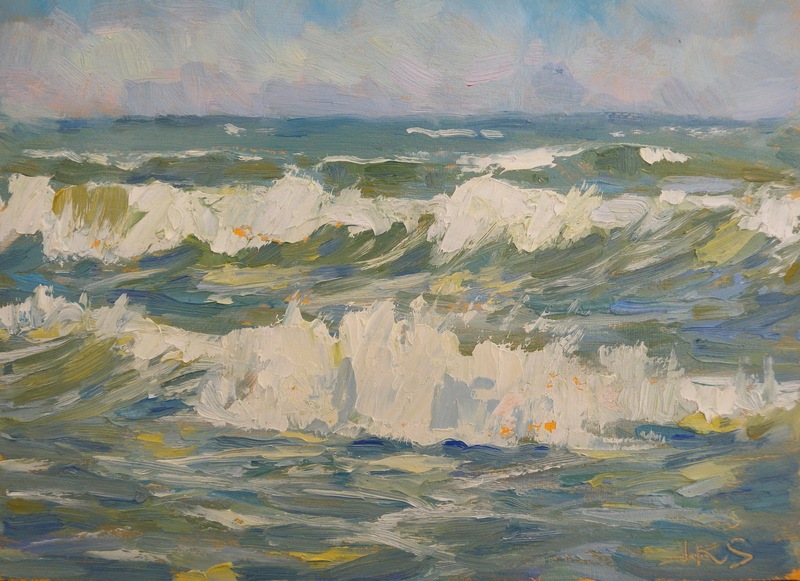 I am painting with both palette knife and brush and the texture is pleasing. The cornflowers (blue) and buttercups in the foreground are just flicks of the knife. Those cornflowers really help tie the foreground to the sky. I had such a good time with the texture that I neglected to put the horses in the pasture. The surface is a little too thick to do that now without making them look tacked on given the scale they would be. I had planned on placing them midground near the clump of trees. I have learned quite a bit from this painting and I would like to follow it with another of almost the same scene. 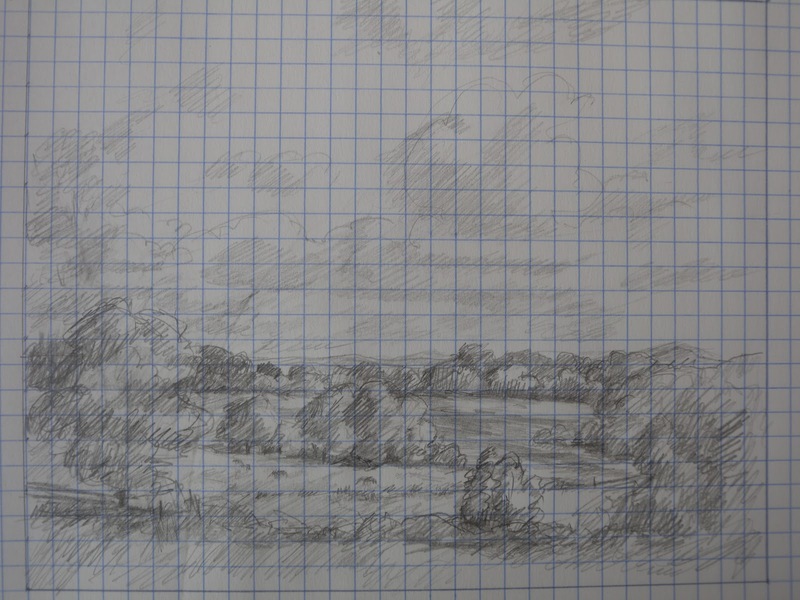 I would like to make the horizon line lower in the next one and add horses as I originally planned. "Painting Lavender at Willow Pond Farm" 11x14 oil on panel SOLD! The weekend was a spectacular one! I spent Saturday at the annual Spring Horse Show at the Madeira School and Sunday was Mother's Day which I spent being well pampered. If I were a still life painter I would be busy trying to capture all the beautiful flowers that were sent to me by my son's and their families and my husband as well as the gorgeous bouquet of red roses I received from the Madeira riders on Saturday. I adore flowers! 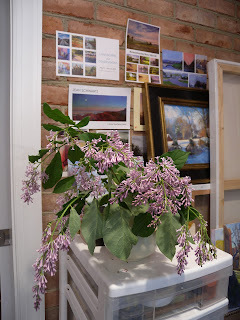 My lilac is in bloom right now and I cut a bunch to put in my studio. Their scent just fills the room! I am a former landscape designer so I go a little nuts at this time of year planning and planting flower beds and large planters on the deck. 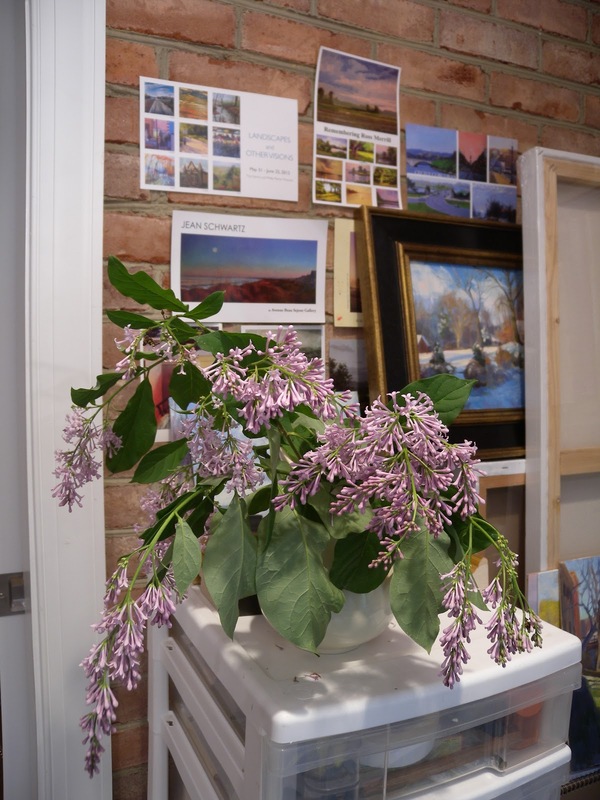 A very fragrant corner of the studio! I finally got a good start on the new painting today. I began with bright natural light but soon had to turn on the studio lights as the sky darkened with the approaching thunder storm. I decided to call it a day at this point. The shadow you see across the sky of the painting is the top of my easel. It was a little risky starting this today because tomorrow I have an all day committment that will not permit me time to paint. I filled as much of the canvas as I could and used a more loaded brush than I usually use at this stage. I was planning ahead wanting to be sure to be able to work wet into wet on Sunday. So far so good ! I remembered to take photos along the way so you can see my process. It is also good for me to have a record of what procedure I used. There are actually times I can't remember how I painted a particular painting! This is the very beginning of the painting. I used an underpainting of cadmium orange, alizarin crimson and yellow ochre, all in a very thin film. I used alizarin crimson and ultramarine blue to sketch in the composition. I really don't need my reference studies at this point as the painting will progress on its own. I will be making decisions based on what works with what is already on the canvas. I had planned a big start on the new painting yesterday but ended up with a very small one. I have been under the weather for a couple of days and I feel like I am moving in slow motion. This painting is going to require standing for long periods and I needed what little energy I had for my animals. My horse and one of my dogs have needed extra attention this week and that was my priority. By the time I got down to work I wanted to sit! I did, however, make a silk purse out of a sows ear. 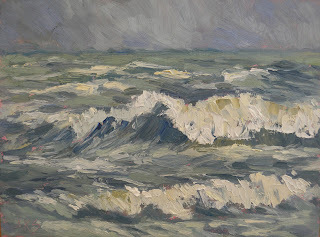 I got at least a partial website update completed, got better photos of some of the paintings I want to upload, and thought more about the new painting. I did this small, quick color study that I rather like. It is a little different than what was first in my head but right now I think this is how I will proceed. It will be an afternoon painting with the light coming from the west which is on the right side when viewing these pastures. I want the breeze coming from the east so the movement goes towards the light. I also graphed the painting out which is something I like to do when working from studies. It makes transferring the sketch to the painting much easier. The photo below will give you and idea of what that looks like but it is a miserable photo. That sketch along with the color study will be taped to the easel when I do the painting. 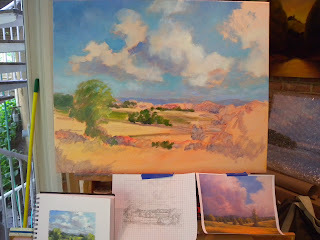 I may give one more color study a go before making the fnal decision. I was happy to have some bright sunlight in the studio today so I could get around to taking more photographs. I have been unhappy with some from the past and I will replace at least one image that is already up on my website. I am really getting the itch to start this painting and want to complete it quickly. I will be in and out of town shortly and this is not one I want to start and let sit until I get home. I hate a stale painting! Departures in the sense of leaving the nest. 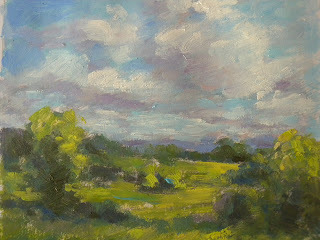 Over the weekend this little plein air painting sold at the Art League Gallery. It is always satisfying to sell a painting and even more so when you know where they are going. I do not yet know the purchaser of this painting but the gallery will soon provide that. If you read the post before we left for the Outer Banks you will remember seeing a painting being packed for shipping and two of my cocker spaniels sitting alongside. The painting inside was "Blue Heaven" and that is the painting that now hangs over the mantle at our house. I knew I wouldn't be happy with an empty wall staring me in the face! Today was a really rainy day. Too dark and rainy to give me a good start on the new studio painting. Instead I headed to the barn and thought I would do more sketches of Gypsy. Turns out that if I try to sketch her in her stall she is entirely too interested in the process and her nose is about all I get to see. Much easier to draw her when she is in the field! After grooming her I headed back to the studio and worked on some more sketches for the painting. I want to know the scene well before I start. I hope tomorrow I will have a start to show you. What has been on my mind is a new studio painting I am about to start. It is 24x30 and on linen. 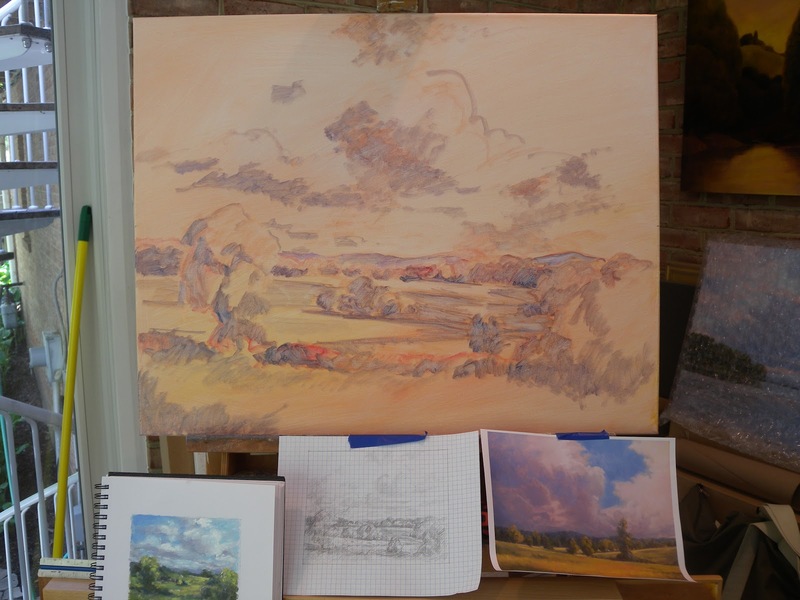 I have toned the canvas with a wash of cadmium orange, alizarin crimson and yellow ochre. I am waiting for it to dry. 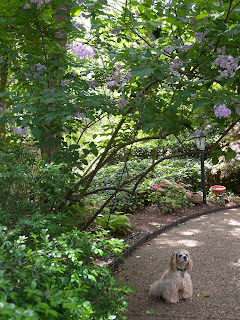 I have loved the sparkling, breezy, jewel like days that we have been enjoying so far this May. There are so many beautiful colors and so much movement and flickering light. 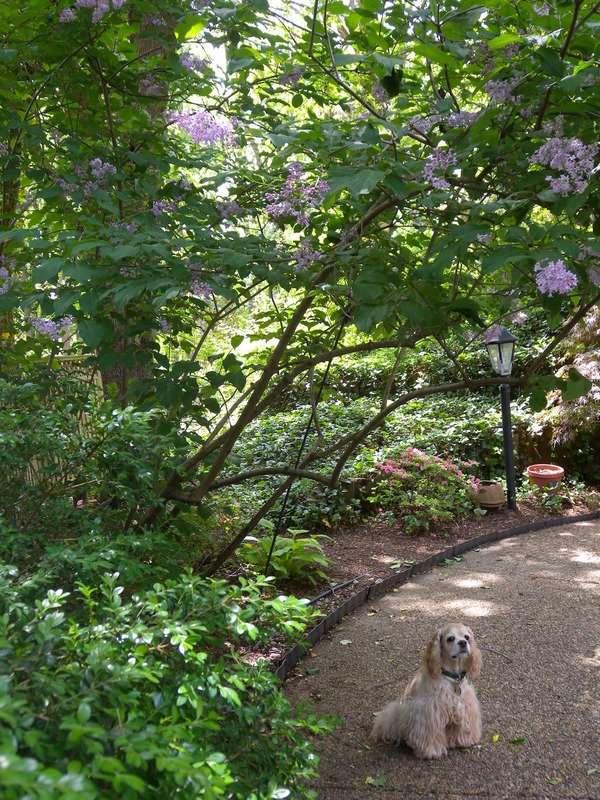 I want to capture that in a painting of the rolling Virginia countryside that I spent so much time looking at last summer when Gypsy was in the hospital out in Leesburg. 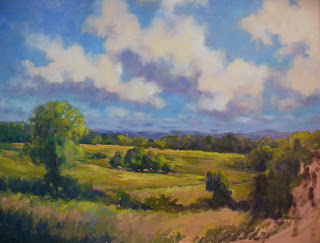 I am using our own pastures for my studies but will add the distant Blue Ridge in my drawings. There will be horses. That is where Gypsy comes in. 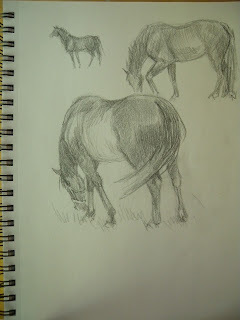 She is being my model for grazing horses and that is Gypsy pictured in the above page out of my sketchbook. 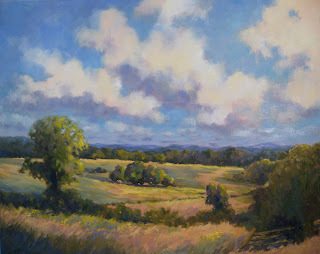 This little plein air painting from last June when I was in Pennyslvania painting the lavender fields has some of the feeling I want in the new painting. It was the kind of day we have been experiencing. 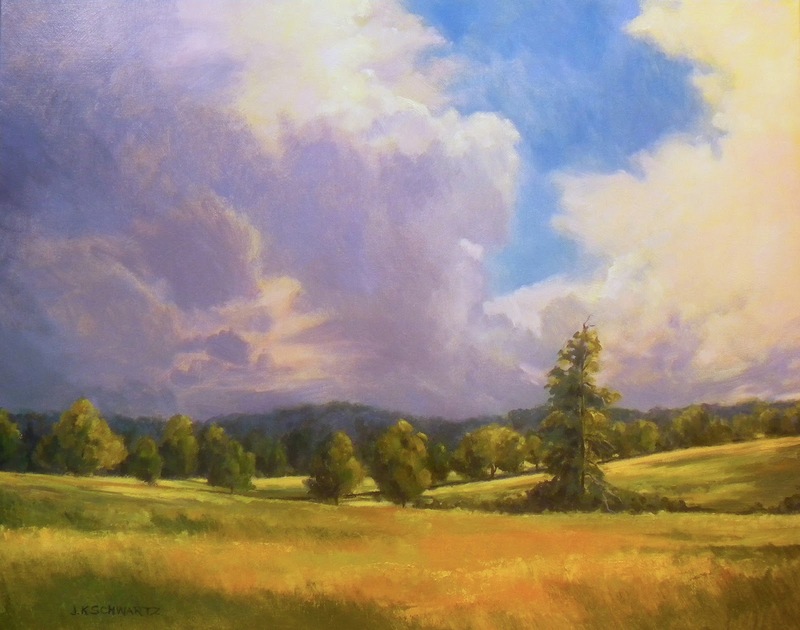 Clouds floating across the sky, the wind rustling the trees and grasses, the light and color intense. It is easy to capture that when standing right there in the field. Will I be successful in the studio? This is another painting I will be paying attention to in preparing for the new one. This is the view in Leesburg I painted last summer while Gypsy was there in the hospital. It is looking towards the neighboring property of Morven Park. The new painting will be looking in the other direction out towards the Blue Ridge. I did manage to keep this painting loose. I painted with both brush and palette knife and will most likely do the same this time. My sky will not be stormy but more like the sky in the Lavender field painting. Here is an image of the finished painting that I had shown you two posts back. The first photo was when it was still on the easel and here is the finished piece with the easel clip marks painted out and with my initials. I am getting better about remembering to sign my work right away. This is not just to claim it as mine but to make sure that when I get a good photo my signature is visible. When I was submitting images for jurying at various shows this year I realized that some of my best photos were before I had signed the paintings. Most juries will require that a signature is visible so I had to do them over and in some cases never got images as good as those first ones. That series has stalled for awhile. I only did two paintings in April due to the weather and the fact that I was running around like a chicken with its head cut off trying to do everything. There was a fundraiser, there was clearing out part of the house in preparation for a small renovation, there was caring for Gypsy and getting ready to leave town on the 17th. I posted one painting I did early in April and I did just one more before we left. The latter shows the trees with just the light green of the budding leaves. By the time we got home those same trees were so lush that the farmhouse was obscured! Here is the second April painting and it was a real quickie! It has a somewhat different feel from the earlier ones and the photo has the colors amped up a little from the actual painting. I have mixed feelings about this one but at least it says Spring. 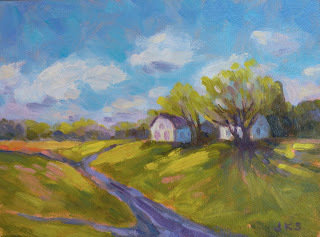 Tomorrow I will share plans for a new 24x30 painting and also thoughts about where the Farmhouse will go from here. The first day we were at the Outer Banks I received some very good news. My painting, "Morning, Washington Square Park" had been accepted for the Oil Painters of America Salon Show in Petoskey Michigan! This is the inaugural, national salon show for OPA and I am so happy to be a part of it! Oil Painters of America is a national organization for oil painters who paint in a representational style. 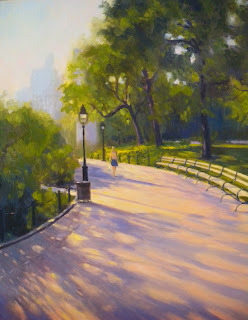 You must be juried in and once a member you can submit work to their national and Eastern and Western Regional shows. We now have about 2500 members and it goes without saying that not all can be selected. I would hate to be one of the jurors because it must be murder trying to decide on which pieces to select. I consider myself lucky. Since I was away from home I knew I would be very busy once we got back because information was needed for the show by today! I am the worst about keeping up with my bio and website. My resume is just a ramble going back to 2004 and I usually just add things as they occur and then lop it off somewhere and tweak it a little each time I need to send one. I tried to do better for this show and added an image of this painting and a photograph of myself. Next is my website. I know that for someone visiting for the first time it looks fine, however, there are a lot of good paintings not up there. There are others that have sold, there are shows that have taken place and there is stuff that needs to come off. There will be an 80 page catalogue with this show and I am going to have a quarter page ad in it which will include my website. I would like to put my best foot forward. Since this painting will already be in the catalogue I have decided to use "Storm Clouds Over Morven Park" for the ad. 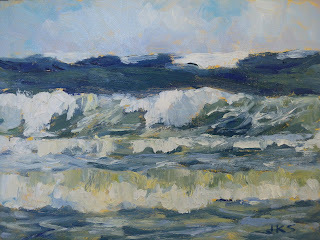 I unpacked my wet paint carriers today and photographed all the paintings I did at the OBX. The ones I showed you yesterday were taken with my i phone while the paintings were on the easel. The ones taken with my camera look a lot better. I will be uploading them to show you in the next couple of days. Here is one more for this evening and I will put another comma here. I hate dropping this blog for such a long time. It was not my intention. If you read my last post, April 15th, I was packing up for our trip to the Outer Banks and I had every intention of blogging from there. I even mentioned needing to remember to bring my card reader. Well, I didn't remember. Not that it would have mattered because the Blogger site went wonky on my laptop and I wouldn't have been able to post anyway. So, we had a wonderful 11 days at the beach and that included an entertaining four day Nor'Easter! I had planned on using all 8 panels I had packed but only completed 6 paintings. The first painting I did is shown above. It was from our first day there and I had set up on the west facing deck that overlooks Currituck Sound. It was late afternoon and the weather was perfect. 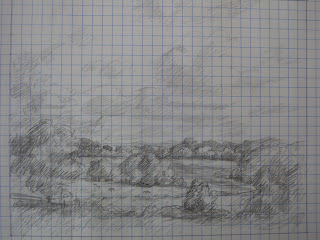 No hint of what was to come:) Usually I paint the Sound itself with lots of sky but on this afternoon I felt like painting the view of our cul de sac. I have not photographed the finished painting yet so I will upload that in a future post. This is what the next morning looked like from one of our oceanside windows. It hadn't started to rain yet but the wind was really blowing and you could get plenty wet just standing where my neighbor was. I appreciated the yellow slicker he wore, it was just the right touch for the painting! I painted this from the window. I would do four more paintings from this same window. 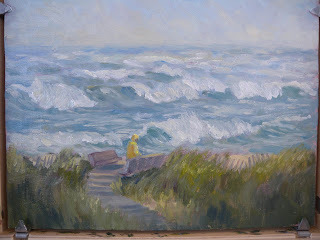 Even when the rain stopped the wind was really strong and I would have been sandblasted trying to paint the surf from outdoors. I enjoy storms like this so much! I love the wildness of it. This particular storm lasted a long time with consistent 30 + mile an hour winds. Inconvenient for the dogs but we all felt cozy indoors. I have been there for much less pleasant Nor"Easters that had winds gusting to 75 miles and hour. Those are scary and the house rocks and the northeast corner of the house makes a screaming sound when the winds blast it. Hard to sleep especially with three frightened dogs! 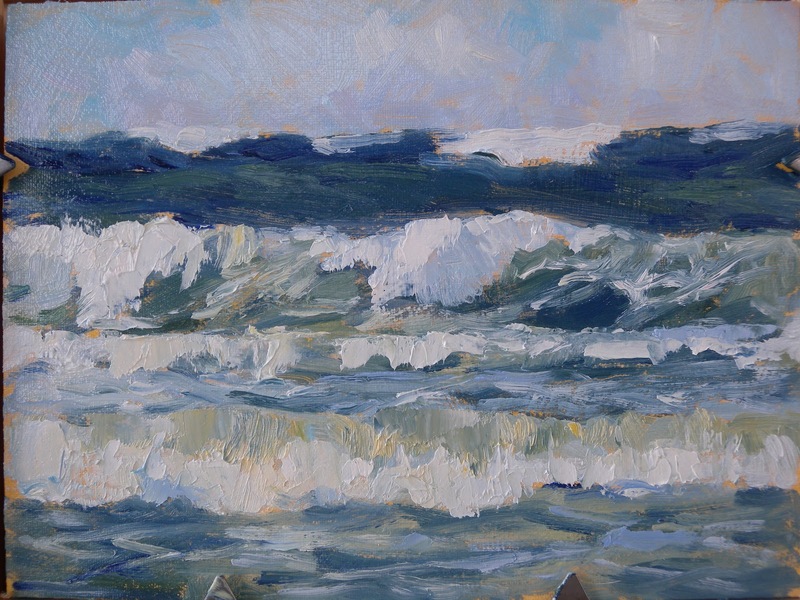 ﻿ This is my favorite of the four surf paintings I would do from my window. The sky had cleared and it was late afternoon. 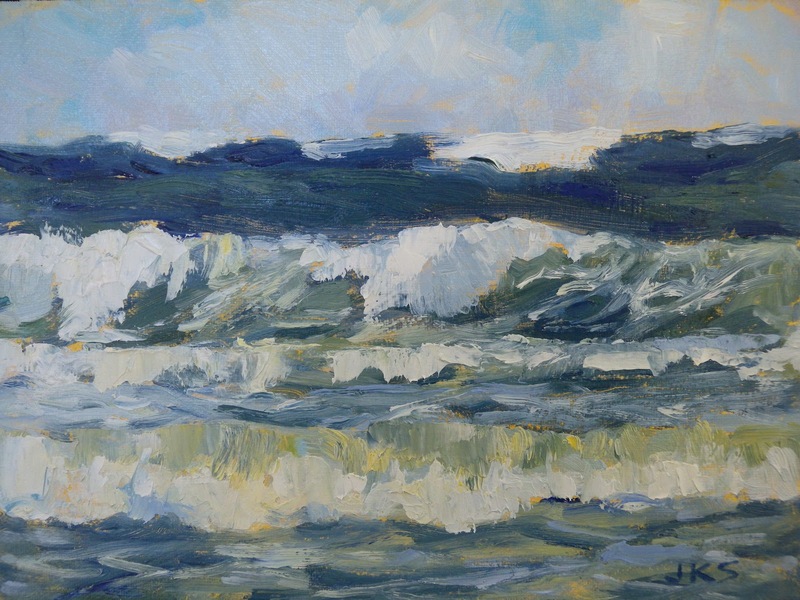 The ocean was a deep blue green making the breaking surf a brilliant white in contrast. I really didn't want it to quiet down! I might continue a series of these small, 6x8 surf paintings each time we are there just like I do with the Farmhouse series here in Virginia. 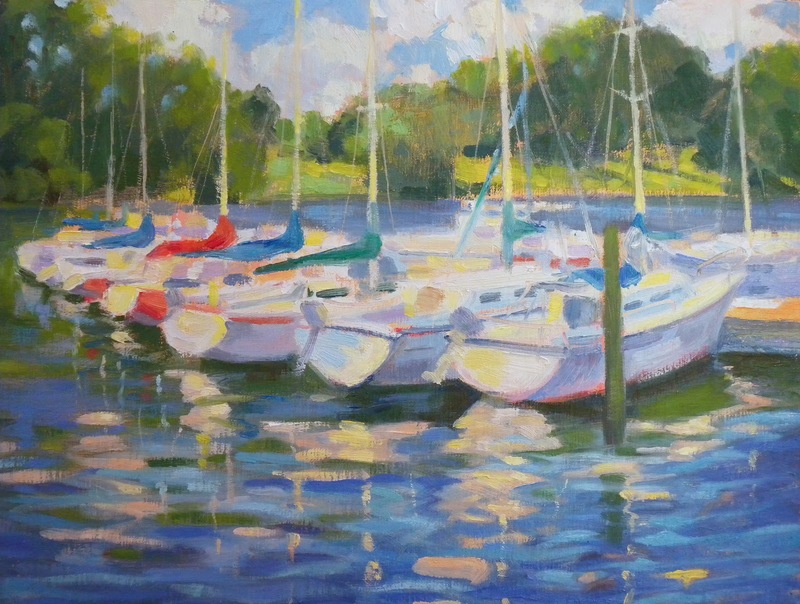 I enjoy the quickness of the oil sketch and there is much to learn about my painting process by doing these. They help develop the eye. Over the next couple of days I will upload the other paintings I did. A lot has been happening since I have been home and I haven't been able to get back to work. I will put a comma here and continue with an update in my next entry.